Communicate Science: What would the first mammal look like? What would the first mammal look like? 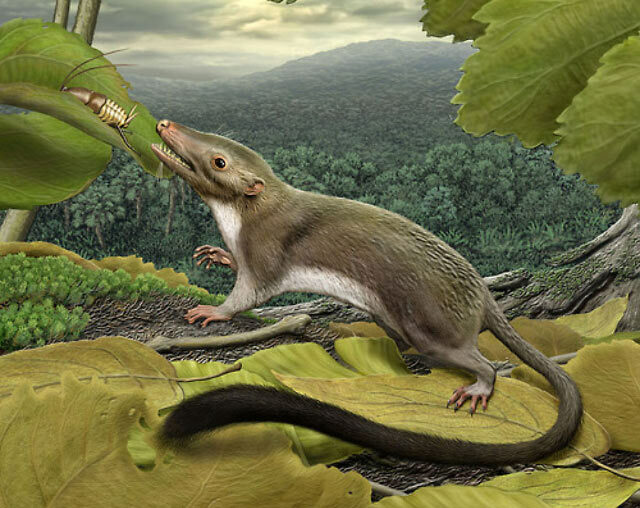 The image below might look like your average small rodent - long tail, sharp teeth for insect-eating and small enough to fit in the palm of your hand, it is in fact, what scientists predict the world's first mammal looked like. About 65 million years ago, some 70% of the species on the planet were wiped out by some cataclismic event. After this wipeout, a new group of animals emerged which were to evolve to be the most successful on the planet. The placental mammals vary hugely in size and shape. Of the c. 5,100 species now extant on earth, they range from the bumblebee bat that weighs around 1.5 g (that's just half the weight of a 2 cent (euro) coin!) to the blue whale that weighs in at 190,000 kg. Now, scientists from around the world have published (pdf) what they believe the first of these mammals looked like. Using a mixture of genetic and morphological data, the team deduced that the "hypothetical placental ancestor" weighed between 6 and 245 g, ate insects and produced single offspring which were born hairless with their eyes closed. The paper concludes that the placental mammals arose quickly after that cataclismic extinction event, known to scientists as the Cretaceous-Paleogene (K-Pg) event, probably between 200,000 and 400,000 years afterwards.